From the kitchen of Italy to your dinning table, we bring you the finest of authentic cuisine. Freshly prepared as you order, Carmen captures the flavors of his homeland to share with locals. With a quaint and romantic ambiance, you surely will feel as if you are spending the evening in Sicily. Let us help you to escape for the night with a savory meal and glass of wine. 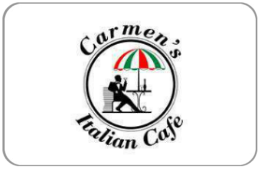 Carmen's Italian Cafe Gift Certificates make the perfect gift for any occasion! Purchase one online here today and treat a friend, family member or business associate with the gift of great food! Click the Buy Gift Certificate button to start the ordering process. Choose message delivery type and pick a value for the gift certificate. I understand that this is only a notification of the gift. The recipient will need to claim the physical gift certificate to be delivered by USPS using the confirmation link that will be emailed to them when I finish with checkout. For balance inquiries call the phone number to a Carmen's Italian Cafe's location below.